This long-established name is of Anglo-Saxon origin, and is either a locational or a topographical surname. If locational, the surname derives from any one of the places called Holbrook in Derbyshire, Dorset and Suffolk; the latter was first recorded in the Domesday Book of 1086 as "Holebroc". The three places share the same derivation and meaning, which is the "hollow brook", a brook running in a deep ravine, from the Olde English pre 7th Century "hol" meaning "hollow" or "sunken", with "broc", a stream. Surnames that are topographical in origin denote residence by such a natural feature. Locational surnames were developed when former inhabitants of a place moved to another area, usually to seek work, and were best identified by the name of their birthplace. While topographical surnames were among the earliest created, since both natural and man-made features in the landscape provided easily recognisable distinguishing names in the small communities of the Middle Ages. 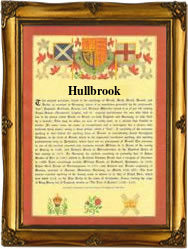 The modern surname has three forms, these are Holbrook, Holbrooke and Houlbrook(e). An early settler in the New World Colonies was Thomas Holbrook, who with his wife, Jane, and sons John, aged 10 yrs., and Thomas, aged 11 yrs., left Weymouth in March 1635 bound for New England. The first recorded spelling of the family name is shown to be that of Richard de Holebroc, which was dated 1189, in "Records of Glastonbury Abbey", Somerset, during the reign of King Richard 1, known as "The Lionheart", 1189 - 1199. Surnames became necessary when governments introduced personal taxation. In England this was known as Poll Tax. Throughout the centuries, surnames in every country have continued to "develop" often leading to astonishing variants of the original spelling.